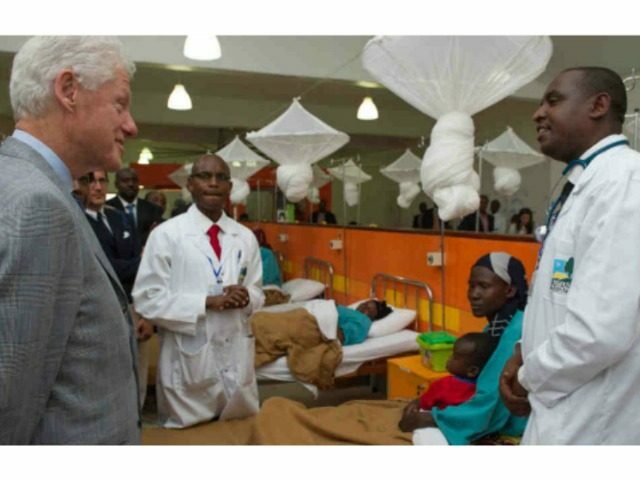 Donald Trump’s presidential campaign released a statement Wednesday in response to news that the Clinton Health Access Initiative (CHAI), the Clinton foundation’s flagship project, plans to spin off into a “completely independent” charity should Hillary Clinton win the U.S. presidency in November. The Massachusetts-based organization, founded in 2002, is the largest initiative of the Clinton Foundation. CHAI’s budget is included in the Clinton Foundation’s annual audited expenses, yearly reports, and is listed under “affiliated entities” on the Clinton Foundation website. Should Hillary Clinton win, Bill and Chelsea Clinton would step down from CHAI’s board and the organization would no longer use the Clinton name. 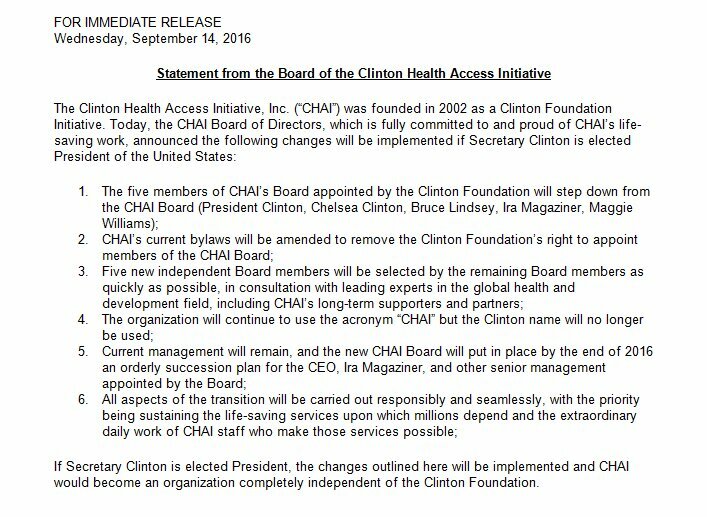 “If Secretary Clinton is elected president, the changes outlined here will be implemented and CHAI would become an organization completely independent of the Clinton Foundation,” the organization’s statement said. “To completely eliminate the prospect of undue foreign influence, the Clinton Foundation and its affiliates should not only cease accepting these donations immediately, they should return every penny they have received from other countries,” the Trump statement said. Last month Bill Clinton told a room full of the foundation’s senior staff that he will resign from the Clinton Foundation board if Hillary Clinton wins the White House in November. The global nexus of corruption and influence peddling at the Clinton Foundation has been widely documented by establishment media for more than a year, thanks to research that first appeared in The New York Times bestselling book Clinton Cash, authored by Breitbart News Senior Editor-at-Large Peter Schweizer. The Clinton Foundation’s decision to shut the spigot on foreign money and Bill Clinton’s promise — should Hillary win — to cease giving paid speeches and cut ties with his foundation comes on the heels of a poll showing that a majority of Americans believe Bill and Hillary Clinton failed to avoid conflicts of interest as millions of dollars flowed into their corrupt family foundation.